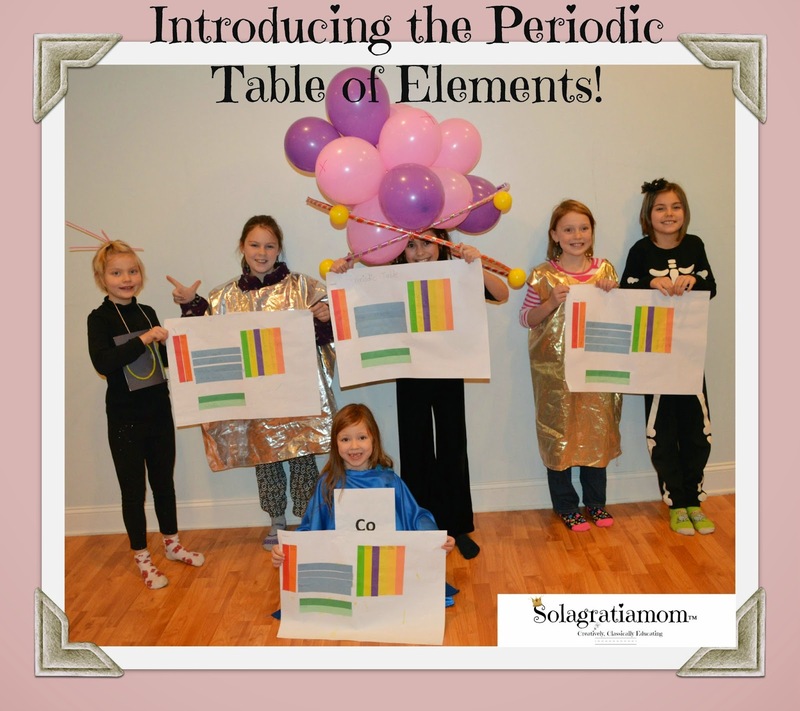 Solagratiamom: Introducing the Periodic Table of Elements! Introducing the Periodic Table of Elements! 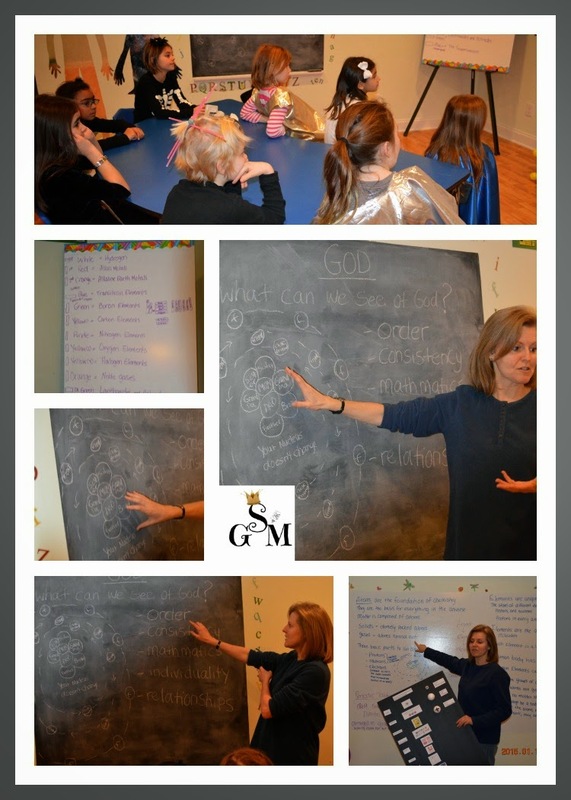 So if you were with us last week, we introduced the idea of chemistry and zoned in on atoms. This week we had an icy start to our day, but we were able to still get together, albeit a little later! Starting out, we built on last weeks' concepts and talked about the elements in the Periodic Table. I reviewed the the atom, and then explained elements and molecules in more detail then last week. We then took a big picture view of The Periodic Table and started with a simple project on the break down of the Table. We related the elements to the alphabet and molecules to the words we can make. From 26 letters we can make thousands of words and from about 120 known elements, we can make millions of molecules. We also talked about how an "a" in the alphabet will always be an "a" no matter what word we find it in. Likewise, the element Oxygen (O) will always be an Oxygen element, no matter what molecule combination it is in -such as H2O (water) or FE2O3 (rust) -the Oxygen atom is still an Oxygen atom in both combinations and hasn't changed. 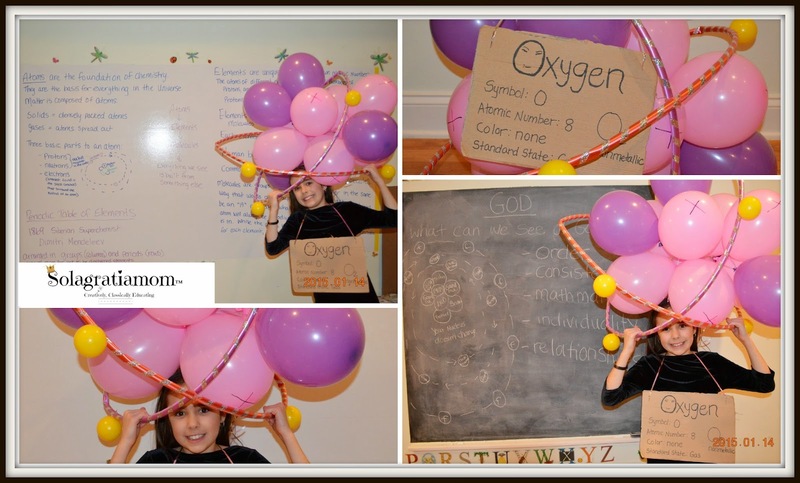 I like to help the kids see God in science when I can work it into our activity. Thanks to a conversation with a friend this week, who shared some ideas as we talked -this was a perfect place for that. We talked about the things we could see that reflected something of God. 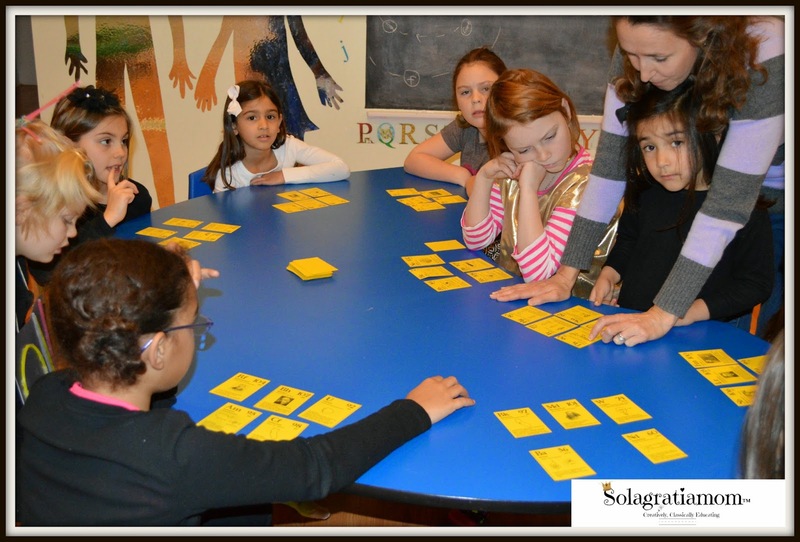 Periodic Table of Elements Game! We ended our time of instruction with a fun game. This game is called "Quick Six" and it's a fast paced, fun game, that really helps the kids learn about the PTE. You can download it for free from www.ellenjmchenry.com. The game gist: The kids each place 5 cards face up in front of them. A "caller" says a clue on the given paper of clues. The first person to slap the table with the correct answer, gets to place their card face down in a "keeper" pile and then draw a new card to replace that one so they still have 5 cards. The first person to have 6 cards in their "keeper" pile - WINS! You can play it over and over again. The are having to read the information about their element cards, in order to try and match the clues given and learning about the elements as they go along! 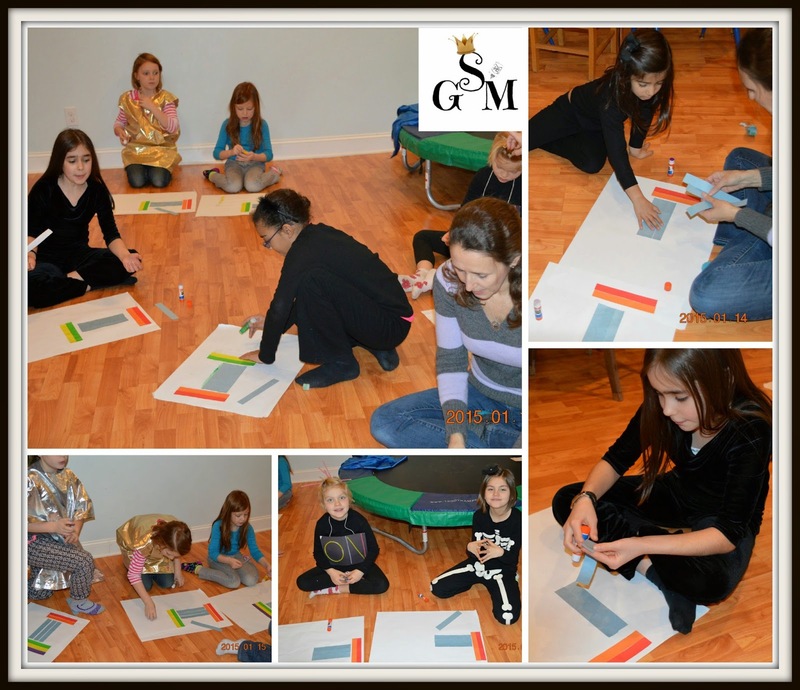 Wonderfully thought out game and easy to play for most ages! Today's snack was themed on the fine arts. It was a throwback to a quieter time in our Nations' history, much like that of a Norman Rockwell cover for The Post! 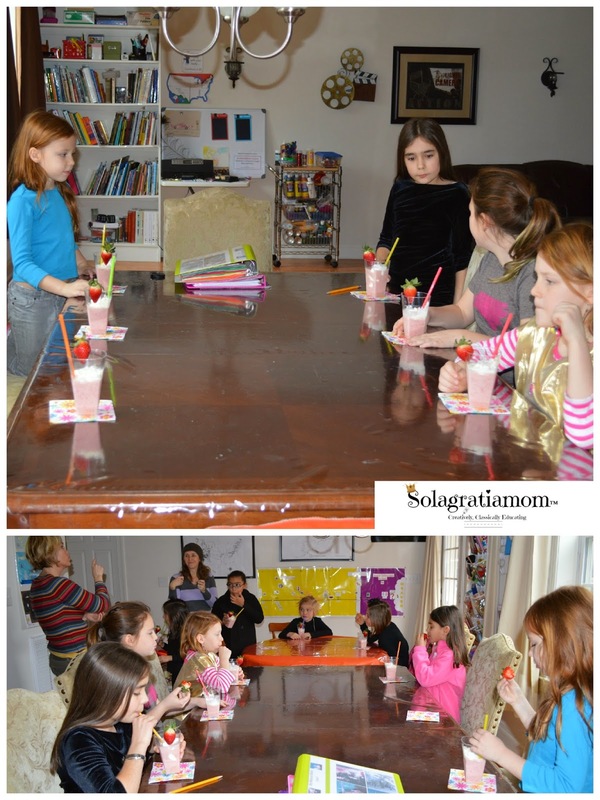 We had delicious (or so I was excitedly told) strawberry milkshakes today and we played a fun Element Riddle game while they slurped away on their milkshakes! All in all it was a shorter but still Wonderful Wednesday! We did a version of this today! My boys are 5 and 7 so I didn't spend as much time on the lesson part and the table wasn't as detailed as it probably could have been, but I didn't want to overwhelm them. Plus, the best thing about this for them was using glue! :) Thanks for this great idea!